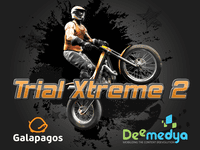 "It is an interactive game that invites you to join the engrossing motorcycle race. Ride your motorbike and surmount the track obstacles using the touch screen and phone accelerometer. Slake your thirst for speed with 60 levels of breathtaking motorcycle adventures. Develop your biking skills: jump, climb, flip! Try to achieve the quickest time possible on each level – thus you can become the world champion. PLAY, HAZARD, WIN!"